Care2 Causes | What Happened to Saudi Journalist Jamal Khashoggi? The Middle East is abuzz over the mystery of Jamal Khashoggi, a Saudi Arabian journalist who walked into his country’s embassy in Istanbul last Tuesday on routine business and vanished. A growing number of people fear that Khashoggi was killed for his work, which was sometimes critical of the Saudi royal family. And some say his disappearance is a chilling illustration of the limits of the free press in Saudi Arabia — a country that has been trying to rehabilitate its image to appear more forward-looking and progressive while continuing to engage in repressive acts. Even so, Khashoggi continued to discuss acts of oppression — like rounding up and silencing opponents of Saudi Arabia’s crown prince, Mohammed bin Salman (pictured above). “I have left my home, my family and my job, and I am raising my voice. To do otherwise would betray those who languish in prison,” he wrote in the Washington Post just a year ago. The sense of alienation and isolation may have been especially deep for Khashoggi, since he was once friendly with the royal family. But he remained a Saudi Arabian citizen, and when he fell in love with a Turkish woman and decided to marry her, Khashoggi was forced to visit the embassy to deal with paperwork. His fiancee waited for him outside, maintaining that he never emerged. Meanwhile, Saudi Arabian authorities insist that Khashoggi left. The Turkish government claims there are no indicators that he exited the building. So where is Khashoggi, and is he still alive? Turkish officials think that they know the answer to this question: They say he was killed inside the consulate, and that his body was moved to another location. Now, they’re preparing to search the building for evidence of the crime. If Khashoggi’s still alive, he may be en route to Saudi Arabia anyway, for a trial that could prove unjust — and Saudi Arabia dispenses the death penalty quite freely. This incident takes place in the context of a long history of press censorship in Saudi Arabia. It is not easy to be a journalist in the country even at the best of times. And especially when someone is critical of the government, citizens fear reprisal — even when they’re not living in Saudi Arabia. The fact that this matter came to a head in Turkey is somewhat ironic; while Turkey presents itself as a crusader for truth in this case, the country is also highly restrictive for members of the press. And given that Turkey and Saudi Arabia are experiencing growing political tensions, Khashoggi’s apparent disappearance could become a political tool for two nations looking for an excuse to escalate conflict. The Washington Post, where Khashoggi had a regular column, has been outspoken in calling for answers and justice in this case — noting that Turkey and Saudi Arabia aren’t the only nations who should be called to account here. The United States, the paper claims, also has a stake in this case, given the relationship between Donald Trump – no friend of the press — and the Saudi Arabian royal family. Some members of Congress, like Senator Chris Murphy (D-CT), agree, and a growing list of elected officials are demanding action. Meanwhile, groups like the Committee to Protect Journalists are also calling for an investigation and accountability. And on October 4, the Washington Post printed what advocates hope wasn’t Khashoggi’s last column. It was blank. Many thanks for sharing. This is very worrying for freedom of speech, freedom of press and democracy. Horrible! Another nail in the coffin of democracy! And Trump is only balancing his billion dollar sale to the Saudi's as worthy of his speaking out about,... Jamal Khashoggi's disappearance is considered a 'Whatever!' by our POTUS. If you caught 60 Minutes last night (Sunday 10/14 ) it was obvious that this president cares for the MONEY, and pretty much anybody or anything else, comes in a far far distant second. The only "Make America Great Again" meaning for Trump, is for the wealthiest to gain more wealth and surpass all other countries. "Whatever" is for the rest of us. And the further down on the economic ladder the more 'whatever' we're going to get,.... - till it's next to nothing..... including our Democracy! This morning Trump is saying the exact same thing about the murderous Saudi Prince as he said previously about Putin . "He said he didn't do it." That's good enough for Trump. As far as Trump is concerned, the case is closed. So what if Trump was colluding with Putin so Putin's hackers could make it look like Trump actually won the US election? So what if Jared and Trump were colluding with an Arab murdering prince so they could enrich themselves and cause more turmoil with an ill-considered arms deal? It is always about the money with Trump, never about doing the right thing. 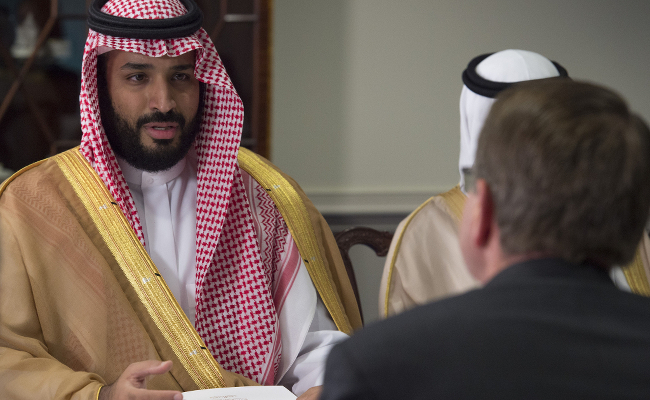 Saudi Arabia's crown prince is another dangerous, self-serving and power hungry leader. It's all about him. Do your homework.....check out his history. Petition signed and thank you for sharing. Disturbing if its true . Why aren't we better than this?? This crook Trump and the US government sells weapons to Saudi Arabia so they can murder civilians in Yemen, and gives Israel 8 million dollars a day so they can continue to murder Palestinians, so nothing will be done about this murder. Saudi Arabia and Israel own the US government.